The “open educational ideas and innovations (OEI2)” initiative has worked towards a better uptake of OER and increased engagement among educators and learners. We promoted open collaboration already when ideas for OER development are being formed and sharing practice AFTER their educational use so that trust into the resources is increased and existing resources become more likely to be re-used. In a number of blog posts we share successful practices presenting initiatives that were open with initial plans & ideas openly or reached out to (new) collaborators at an early stage. In the next paragraphes you will read about how Higher Education lecturers from two European countries co-created an online course for learners at their universities making use of the Idea Space platform. Vytautas Magnus University (VMU) offers students the possibility to participate in virtual mobility programmes, i.e. to learn for a limited time with students at a partner university without physically leaving their home country by means of online technology. The idea was to create a course on “Concepts of adult education“ in English for students of several partner universities. VMU was already running a course on the topic in Lithuanian, but the course curriculum needed to become more suitable for virtual mobility and students from different national and cultural context. Developing and launching the course was funded by an ERASMUS+ project called „OUVM – Opening universities for virtual mobility“. The course leaders co-created the course online at the Idea Space platform. The three course leaders shared educational resources early and used those to run the course with learners at two universities in Lithuania and one in Italy. Those efforts resulted in a 14 week course. How was the collaboration organized? What were main activities, tools used and organisations/individuals involved? Collaborators used different tools for communication (email, Skype, etc.) and the Idea Space platform with its course creation template that provides a tested structure for collaborative course creation. 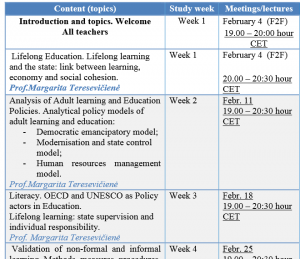 To assess tendencies of lifelong learning in educational policy documents of the EU. To prepare critical analysis of the chosen theories of adult learning. To adapt and further develop the course for learners from Europe, the course leaders shared materials in English such as readings, videos, tests, etc. The course itself is grounded in Education science and learners need to consider adult education theories to interpret the topics discussed. The course is part of VMU formal Master of Education Management study program but it has been elaborated to make it in EN, suitable for virtual mobility and outside students from other partner universities who will undertake virtual mobility. How did the initiative evolve further? Two instances of the course were held starting in September and November 2016. Those carried 6 ECTS for students of the “Master of Education Management” study programme at VMU. Collaborators found the Idea Space platform useful, especially to share educational resources in English and to agree on a course structure. Feedback from VMU lecturers helped to improve the platform further, in particular the template for collaborative course development.